Kevin Durant and LeBron James continue to be the class of the league. With the book closed on the 2017-18 NBA season, we pick out our team of the season (or All-NBA First-Team if you like). Naturally, the frontrunner for MVP should be one of the five best players on the season. The killer crossovers, the stepback 3s, the Euro steps… Harden’s game is in many ways the antithesis of beautiful, free-flowing basketball, but there’s no doubting it’s effective and an art form in and of itself. There are few players in the history of the game better at scoring in one-one-one situations and Harden’s stature in today’s hierarchy is near the very top. While Harden no doubt gets a spot on the team, choosing his backcourt mate makes for a decision that’s a little less obvious. If not for his 31 games missed to injury, Stephen Curry would earn the spot after another fantastic, but truncated, season. Instead, Lillard is deserving of the recognition, finishing as a back-end MVP candidate for leading Portland to the third-best record in the West and averaging 26.9 points, 6.6 assists and 4.5 rebounds. Often snubbed, Lillard finally gets his due. It’s difficult to go into hyperbole with LeBron because he continues to amaze, even into his 15th season. At the age of 33, James had one of the best seasons of his career, in which he played all 82 games for the first time and averaged 27.5 points, tied a career-high with 8.6 rebounds and set a new benchmark with 9.1 assists. 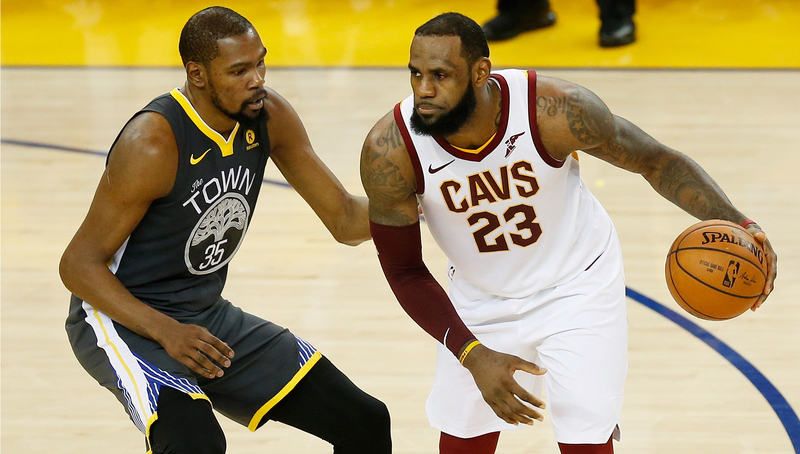 He’s a walking triple-double and even though his defence has slipped over the years – mostly due to effort – LeBron remains the best player in the world and a dominant singular force. He may not end up as one of the top vote-getters for MVP, but Durant had an extremely efficient campaign that went under the radar because of the Warriors mostly sleepwalking through the regular season. He averaged 26.4 points, 6.8 rebounds and 5.4 assists while almost being part of the 40-50-90 club for the second time in his career, shooting 51.6 per cent from the field, 41.9 per cent on 3s and 88.9 per cent at the free throw line. Another title and Finals MVP wasn’t a bad way to end it. The Pelicans two-way star wasn’t just the best big man in the league, he had a legitimate case for MVP – or least for runner-up to Harden – after his torrid stretch in the wake of DeMarcus Cousins‘ season-ending injury. One of the few players who can impact the game at an elite level on both ends of the Court, Davis averaged 28.1 points, 11.1 rebounds, 2.6 blocks and 1.5 steals. He also extended his range and shot 34.0 per cent from deep. Just an absolute terror. The Celtics improved their win total under Brad Stevens for the fourth-straight year. With the book closed on the 2017-18 NBA season, we’re making our picks for the individual end-of-year awards. Here, we hand out the hardware for the biggest influence on the sidelines. 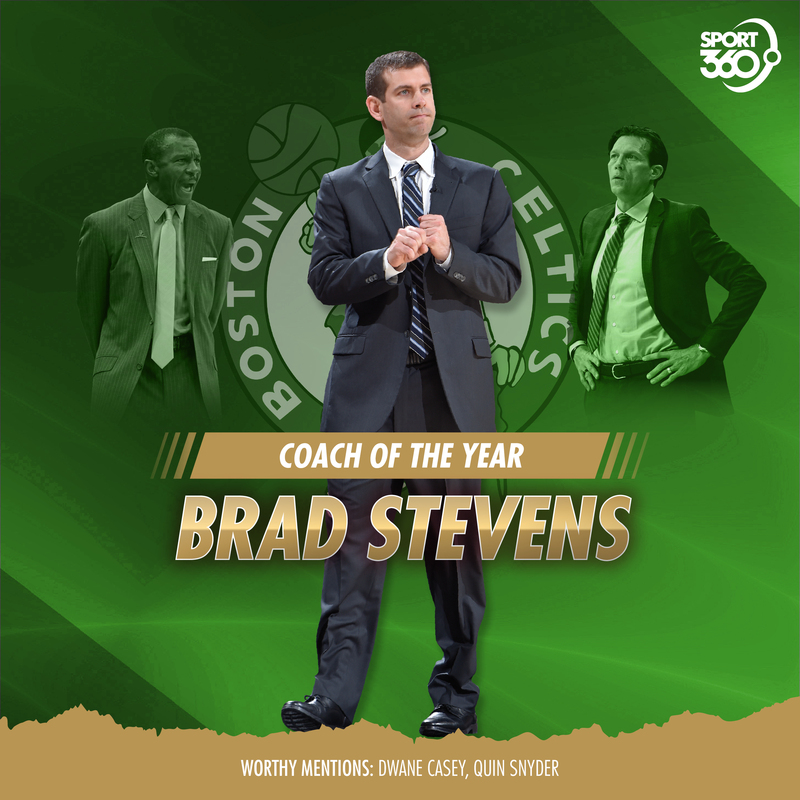 The Boston Celtics leader is already one of the best coaches in the league, if not the very best, and it’s high time he gets the validation by walking away with the award. Boston may have met preseason expectations by getting within a game of the NBA Finals, but everything that happened in the middle made the end result look that much more impressive. Stevens lost Gordon Hayward on opening night to a broken leg and Kyrie Irving before the playoffs to knee surgery, while juggling numerous other injuries to key players in the rotation. And yet, that didn’t stop the Celtics from improving on their win total from the previous year – the fourth-straight year they’ve bettered their record under Stevens – to finish second in the standings, before taking LeBron James to seven games in the Eastern Conference Finals. 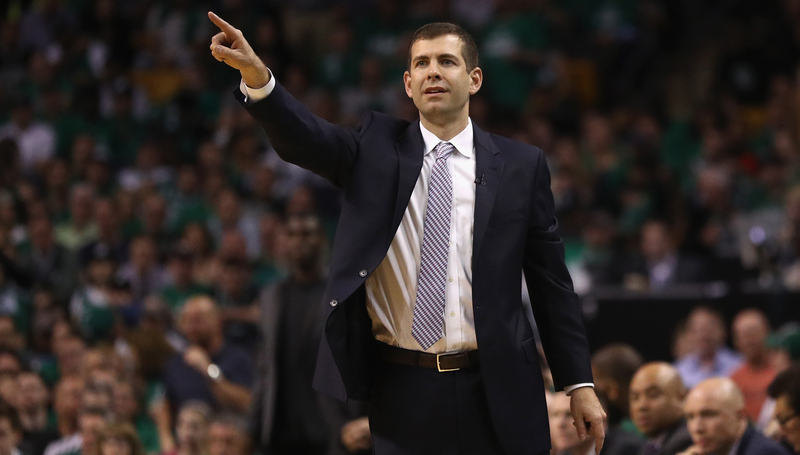 Along the way, Stevens helped develop young talents Jayson Tatum and Jaylen Brown, who were playing at near All-Star levels by the end of the playoffs. If Stevens has a healthy roster to work with next season, it’s fun to imagine how much he’ll get out of it. The NBA coaching scene can be a cruel world, as proven by Casey getting fired after leading the Raptors to a franchise-best 59 wins. 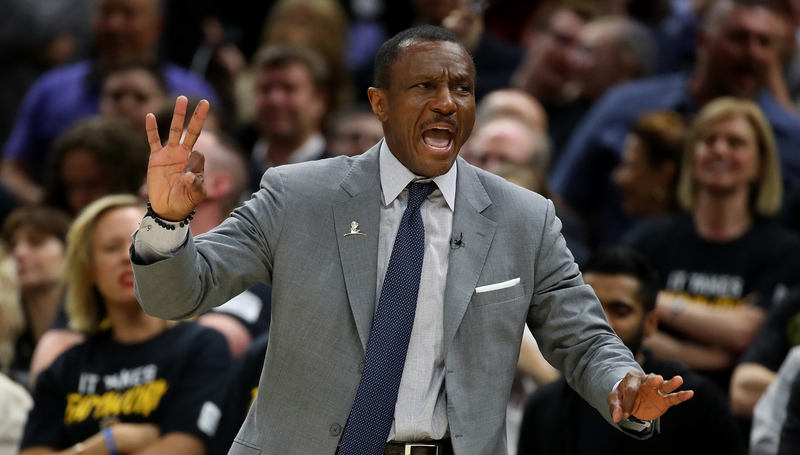 Toronto ultimately were swept at the hands of LeBron for the second straight year, but not before Casey did wonders with a team that completely overhauled their style of play. Synder did a comparable job to Stevens, guiding the Jazz to 48 wins despite losing Hayward in the summer and then Rudy Gobert to injury for most of the first half of the season. 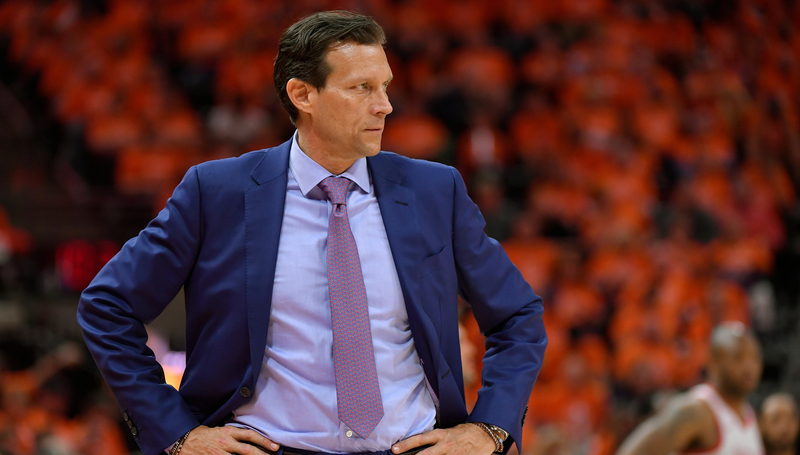 He also helped develop Donovan Mitchell and got Utah to the second round of the playoffs without much star power. 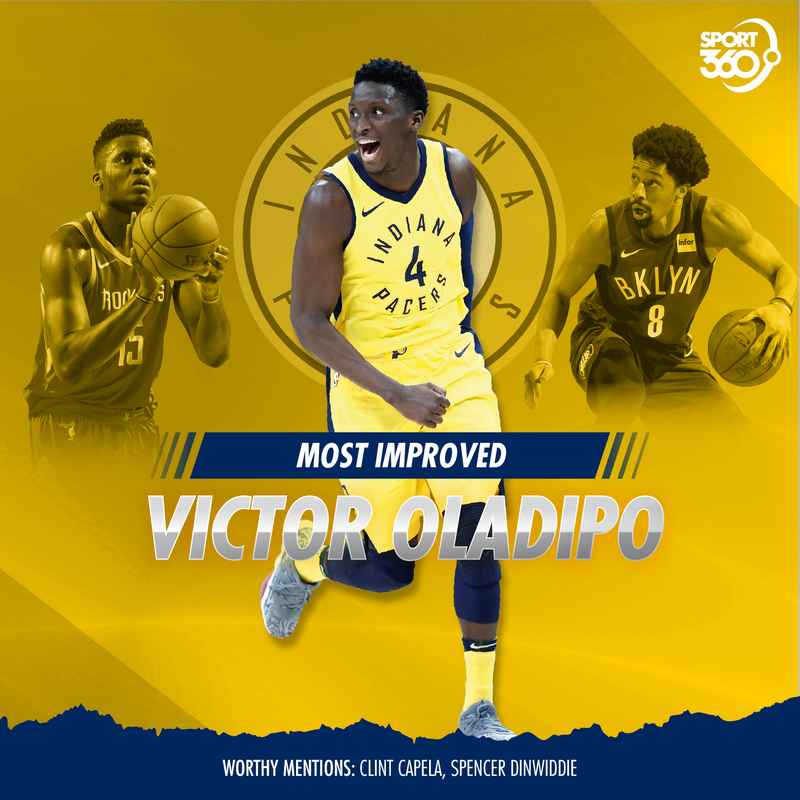 Victor Oladipo became a star in his first season in Indiana. With the book closed on the 2017-18 NBA season, we’re making our picks for the individual end-of-year awards. Here, we look at the players who took their game to another level. When Oladipo was traded from Oklahoma City to Indiana last offseason, no one could have seen this coming. With the Pacers, he went from being a good player to one of the best in the league as his transformation that turned him into a star. Whether it was getting out of the shadow of Russell Westbrook, changing his physique and improving his game, or a little bit of both, something changed with Oladipo as he made Indiana’s trade of Paul George completely worth it by instantly becoming the franchise’s next cornerstone. At the age of 25, Oladipo significantly raised his stats across the board, averaging 23.1 points, 5.2 rebounds, 4.3 assists, 2.4 steals, 47.7 per cent shooting from the field and 37.1 per cent from long range. 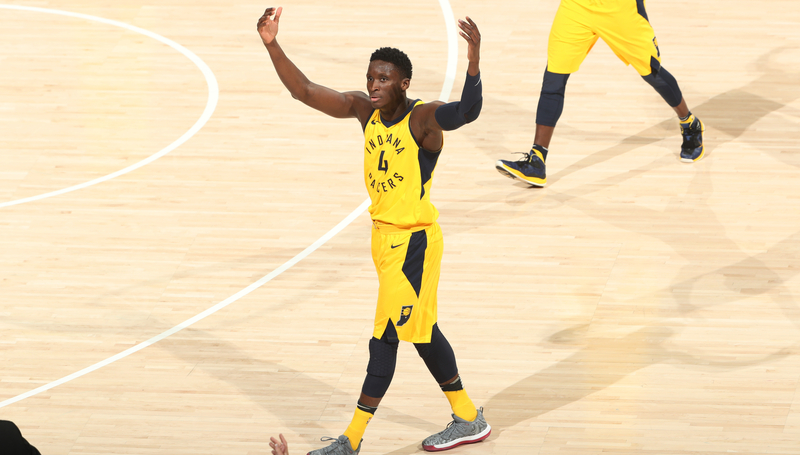 As a terror on both ends of the floor, Oladipo guided the Pacers to the fifth-best record in the East and was a game away from knocking off LeBron James in the first round of the playoffs. It’s very rare a player improves to the extent Oladipo did over a year, but he seized the opportunity and rose to a level that would have been impossible to predict. Having developed into one of the best young bigs in the league, the Rockets centre was critical to Houston’s success as a roll man and rim protector. He plays his role perfectly, doing all the dirty work without requiring plays run for him to be effective. From a second-round pick in 2014 to being one of the best players on a team – albeit a weak team – Dinwiddie has risen in prominence since entering the league as nothing more than a so-so prospect. He was far from efficient, but the Nets guard averaged 12.6 points per game after averaging 7.3 last year.